HelpHound Blog: Why do the restaurant multiples ignore the power of reviews? Why do the restaurant multiples ignore the power of reviews? Regular readers will have seen this topic covered before, but we make no apology for raising it again. Do the owners of these chains not realise what impact reviews have? That looking great can drive business through their doors? That looking 'not so great' has the opposite effect? ...all scoring less than 4 on Google (who cares about any other sites these days?). All allowing a tiny minority to totally dominate their online images. ...and did they thank him? Did they ask him what they could have done to make him happier? No, of course they didn't - after all, they were piling in the customers in those days - why get involved with reviews? That nineteen is under three negative reviews a year! 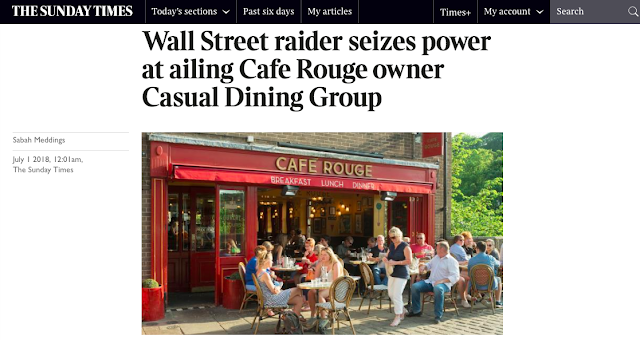 Just two unhappy customers a year have destroyed that Cafe Rouge's online reputation. Bringing it below the Google filter and putting off countless potential customers. What should Cafe Rouge have done? And what are the lessons for other businesses like them? ...and, we're guessing - but it's a very educated guess indeed - not making headlines on the front page of the Sunday Times' business section. We are not going to waste your - or our - time arguing just how influential reviews are in today's marketplace (we can hear the cries of 'they've been brought low by changes in spending habits' or 'it's the crippling rents in UK high streets that's doing it'). It costs so little to address a situation such as the one we are looking at here we would simply suggest doing it. Adopting review management and seeing the results for yourselves.